This post was sponsored by Annie Selke as part of an Influencer Activation for Influence Central and all opinions expressed in my post are my own. 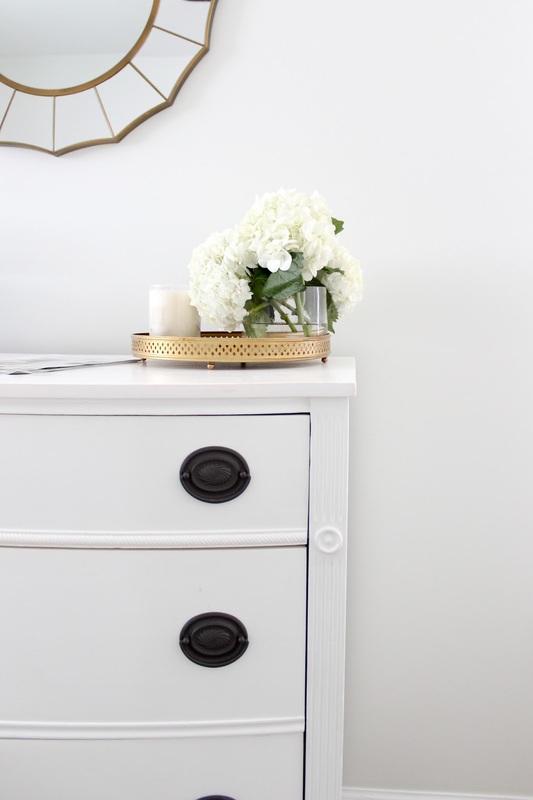 I'm so excited to finally share our guest room makeover! 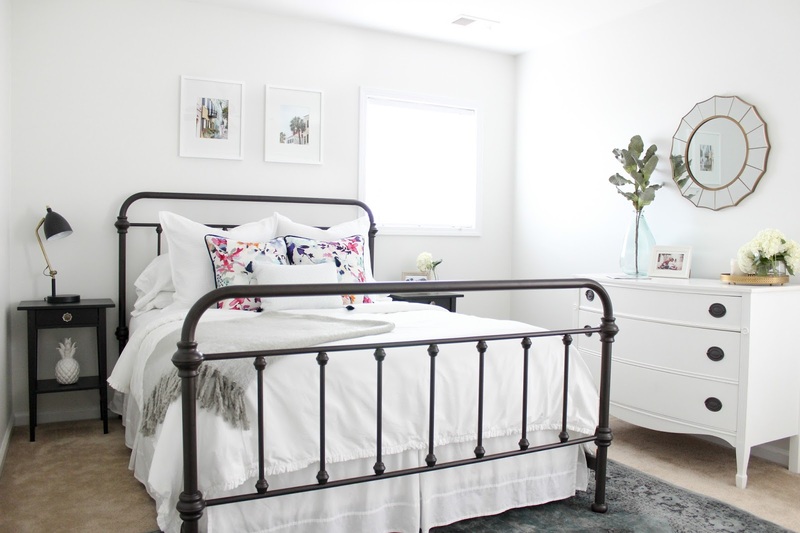 This room has come such a long way after this post... we painted the tan walls, added beautiful white bedding with lots of texture, and hints of Charleston to make it feel welcoming for our family and friends. While I've always loved our farmhouse metal bed and antique dresser (which was originally in Rowan's nursery here), I think I'm most excited about the bedding. Between the bright white, subtle ruffles on the duvet, and textured coverlet, the style and comfort-level is exactly what I was looking for in this room. 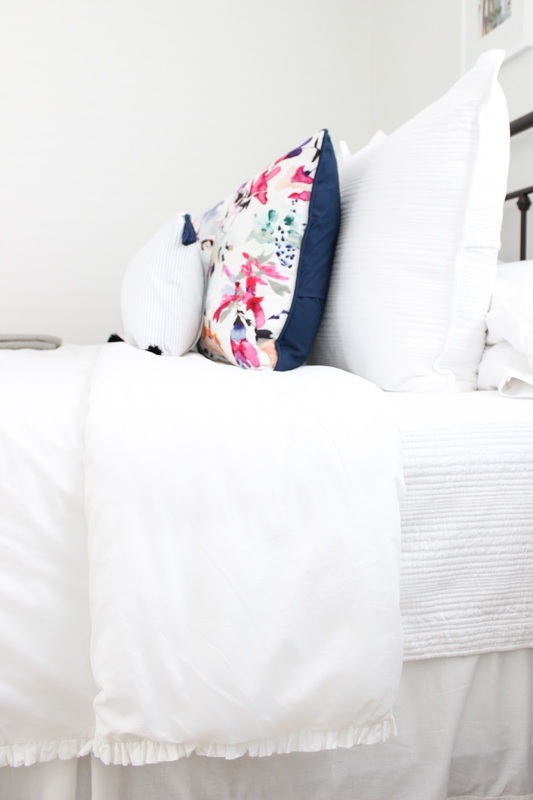 When I saw this ruffled duvet in the Annie Selke catalog I knew I had to have it for this room! It picks up the farmhouse style without being too frilly. I'm still not sure if I want to put a curtain up on that awkward window or not, but this is definitely the layout that makes the most sense in this room! The coverlet and euro shams are so soft and add some texture to the bedding. I also added DIY watercolor floral pillows, made from a cloth napkin, and added some tassels to the striped lumbar pillow which I already had. 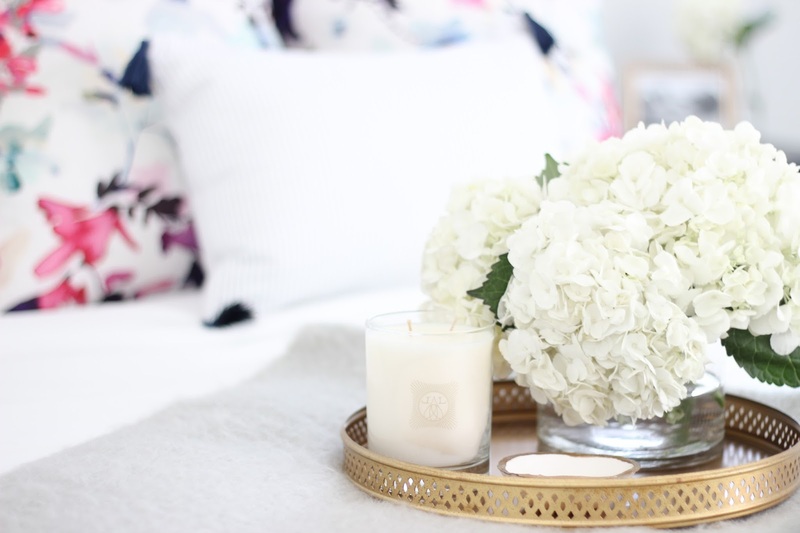 This Anne Selke peony candle makes the room smell amazing! I don't think I've ever had a candle make the whole room smell this good without lighting it. I love this room so much, I can't help spending time in it now! The light is amazing and with the white bedding its the brightest room in our house. And thankfully we finished just in time for a visit from Grandma while we head to Hawaii! 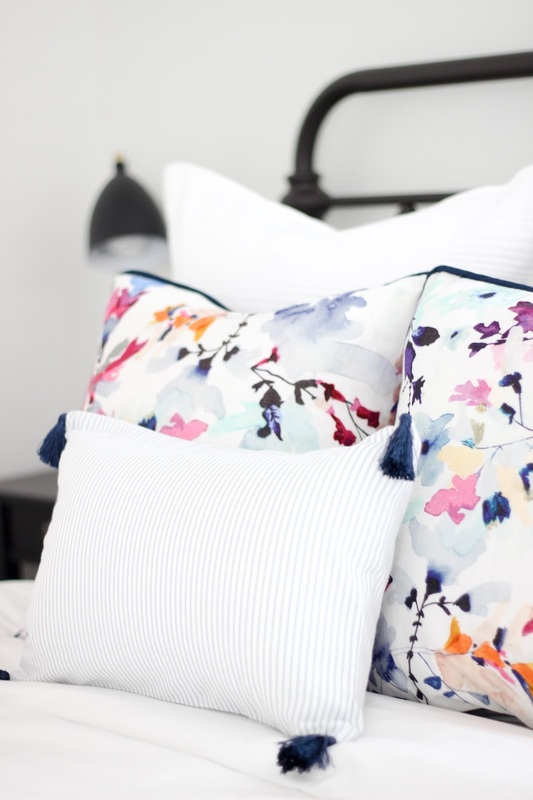 If you're looking for new bedding, I highly recommend the Annie Selke brand. 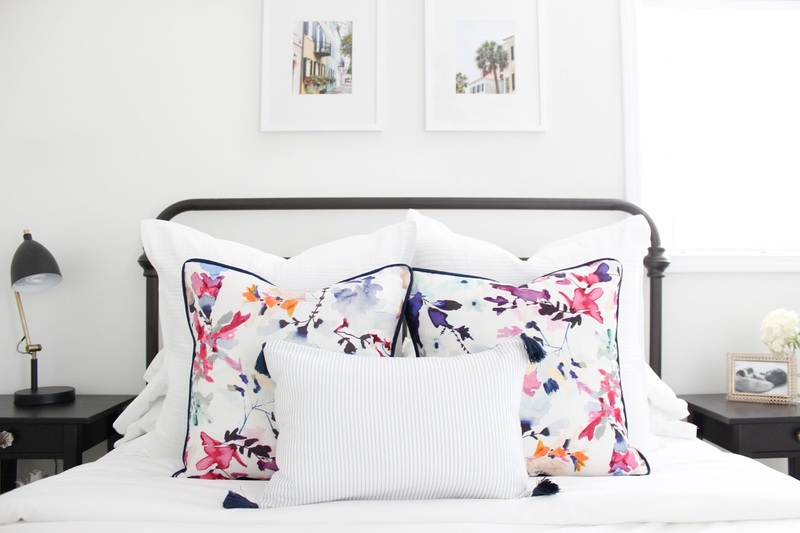 You've probably already heard about Dash & Albert, but Annie Selke's other companies like Pine Cone Hill are some of the top brands for bedding and home decor. Though the price is on the higher end, its so worth it for the quality! Plus if you sign up for the Annie Selke email newsletter here you can get 15% off of your first order! The room could not be prettier!! The pillows turned out amazing! You did such a great job! Your room is GORGEOUS!! Absolutely love it- well done! Beautiful! Love those pillows. Nice work, lady. And hooray for a trip to Hawaii! 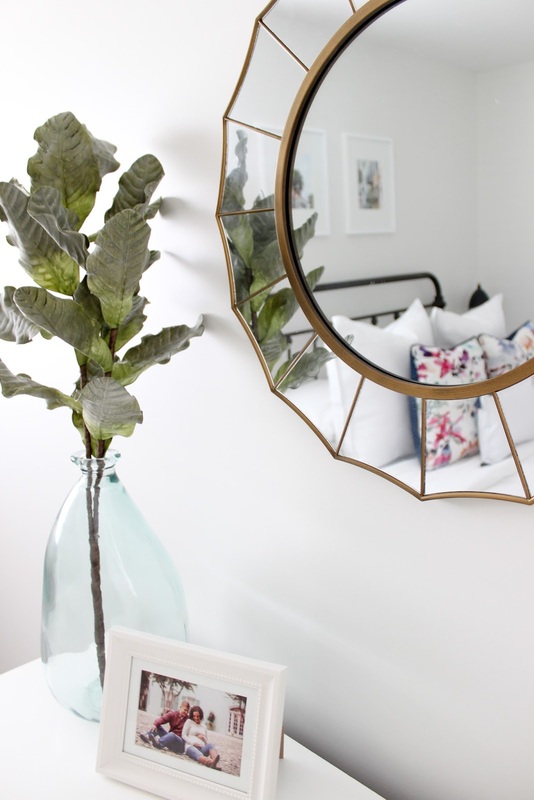 Gorgeous guest bedroom!! I love every detail of it! I looooove it! The bedding is gorgeous. 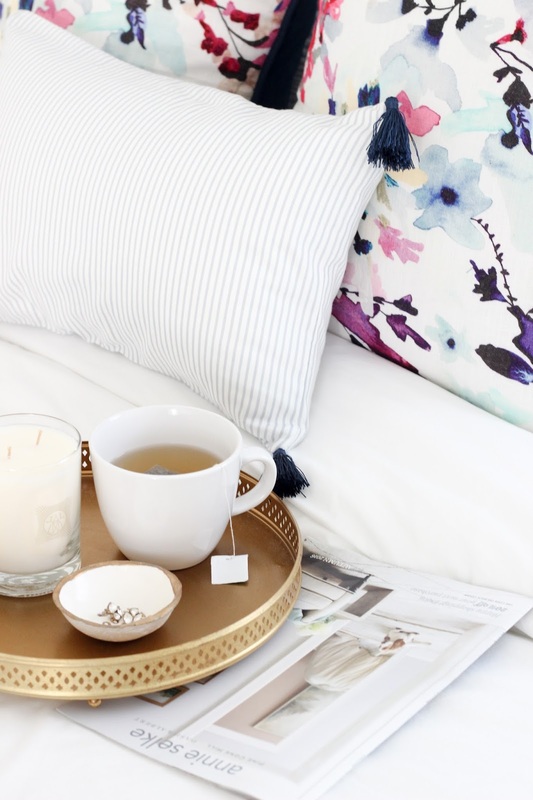 This has totally inspired me to get my own guest bedroom whipped into shape! I agree with every other comment - gorgeous, and so put together! Ugh, our new house has ALL tan walls, I can't wait to get rid of them haha! Absolutely love how this room turned out!! And fingers crossed for that giveaway! !